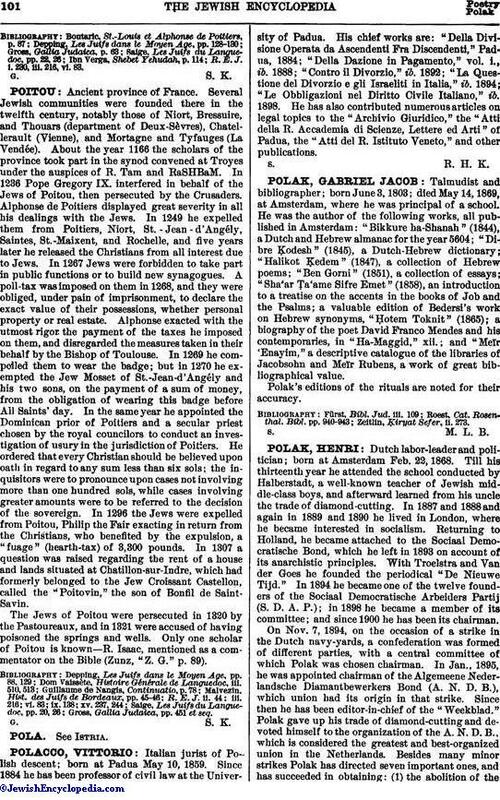 Talmudist and bibliographer; born June 3, 1803; died May 14, 1869, at Amsterdam, where he was principal of a school. He was the author of the following works, all published in Amsterdam: "Bikkure ha-Shanah" (1844), a Dutch and Hebrew almanac for the year 5604; "Dibre Ḳodesh" (1845), a Dutch-Hebrew dictionary; "Halikot Ḳedem" (1847), a collection of Hebrew poems; "Ben Gorni" (1851), a collection of essays; "Sha'ar Ṭa'ame Sifre Emet" (1858), an introduction to a treatise on the accents in the books of Job and the Psalms; a valuable edition of Bedersi's work on Hebrew synonyms, "Ḥotem Toknit" (1865); a biography of the poet David Franco Mendes and his contemporaries, in "Ha-Maggid," xii. ; and "Meïr 'Enayim," a descriptive catalogue of the libraries of Jacobsohn and Meïr Rubens, a work of great bibliographical value. Polak's editions of the rituals are noted for their accuracy. Zeitlin, Ḳiryat Sefer, ii. 273.